After being robbed once for my paint while initially painting the wall, having the mural be tagged after only running one day (which was expected), and coming back the same day with my friend Erlin Geffrard to paint back over the mural and get yet another amazing reaction from the community i have this to say about the painting on the wall. To me this particular painting is about the false grandiose notions of Christian/Catholic myth and the effects these notions have on the moldable minds of the consumers of them; both historically and in present day society. The archetype of the "beast" is a symbol in itself as well. A symbol of evil, maybe even an injured gigantic satanic figure, huddled over crawling towards the small glowing cross. I made the crucifix glowing with a sort of neon green and orange light because tor me it is a reinterpretation of the huge neon green, blue, orange or pink crucifixes I would see at night when driving through countless small towns cross-country. I would be driving in Montana right outside the Crow Indian Reservation and then all of a sudden there would be a huge glowing crucifix in the side of a hill. To me these glowing symbols hint at a cultural genocide that has been occurring ever since the original "kite skeleton" fetishism began. THANK YOU MICHAEL WILD aka Piotr Rizov AND KOOL KID KREYOLA aka Erlin Geffrard for all your help. This mural wouldn’t have been possible without those two. So thanks. 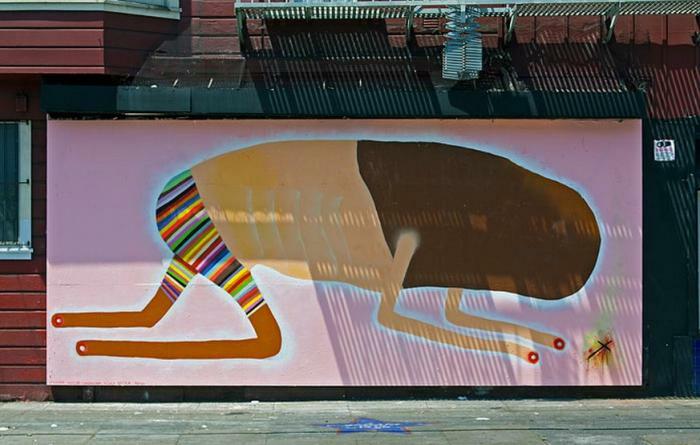 Also, thank you to Adriana Grino and Ani Rivera at the Galeria de la Raza for supplying this wall and to Jorge Gonzalez as well as and Darryl Smith at the Luggage store for including this piece in the Luggage Store Gallery's Streetopia project in collaboration with Galeria de la Raza.